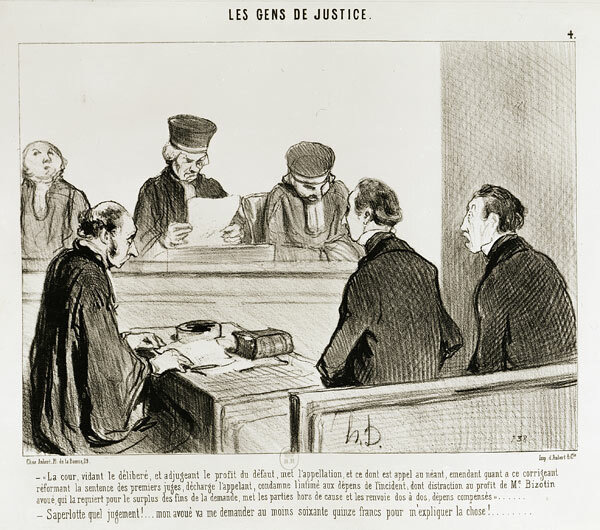 The new UCOP scandal is the worst in a long-running series. This one was prompted by a state audit of the Office of the President's budget, which found issues the auditor claimed cast doubt on UCOP's honesty and competence. State officials reacted angrily to the four biggest of a number of charges from State Auditor Elaine M. Howie (pictured): that UCOP spends a good chunk of money from an "undisclosed budget" that is separate from its public budget; that it affords this undisclosed spending with a tax on the campuses that yields more revenue than it needs; that it spends this excess money on systemwide programs that could go instead to students on campuses; and that it appears to have changed the results of the auditor's campus surveys to make itself look better. The auditor also rekindled longstanding claims that UCOP hires too many administrators and then overpays them. It even dragged pension underfunding into the mix. 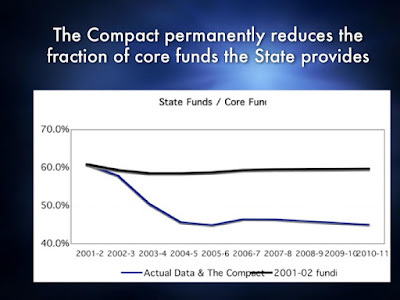 The interaction between the State Auditor and UCOP has turned a boring problem of inadequate budgetary records into another political firefight. Together the parties have produced a new round of heightened denunciations from state officials that include calls to rescind the 2.5% tuition increase and to increase direct legislative oversight of UC. The report itself runs 169 pages and includes a 34 page, single-spaced UCOP response that rejects 72 separate passages in the audit. This is in turn followed by the auditor's blanket rejection of UCOP's rejections. The report also includes a 6 page letter from UC president Janet Napolitano that, in spite of the confrontation elsewhere, accepts nearly all of the auditor's technical recommendations for accounting improvements. The angry stand-off in the full document massively overshoots the stated policy differences, and the mutual hostility becomes a problem in itself. Politicians and the press reacted as much to tone as content. Legislative hearings have been called for Tuesday. Long-time LA Times columnist George Skelton signaled renewed doubts about UC's ability to serve the state with a piece entitled, "Big Changes Needed at UC--Starting with the Kool-Aid-Drinking Board of Regents." This fight is actually unnecessary, and marks another setback for public understanding of the deeper issues raised by the report: research costs, research benefits to undergraduates, and public-good management standards. First, on the budgetary issue, a bit of background. 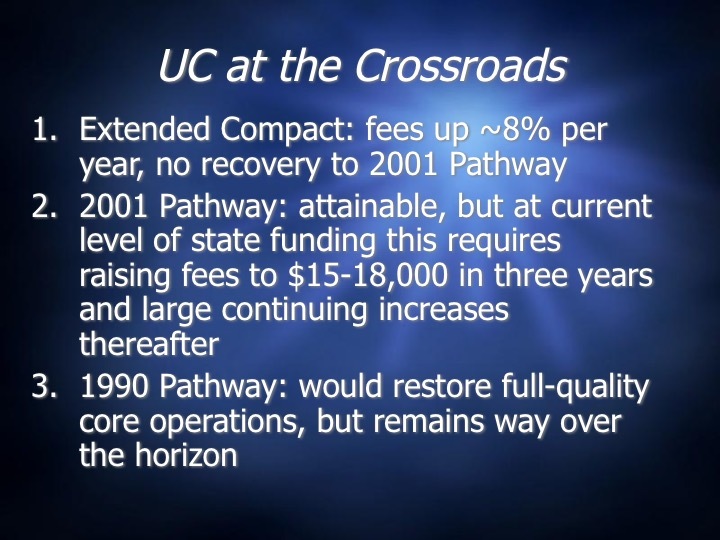 UCOP does two big things: performs central administrative services and manages systemwide programs. 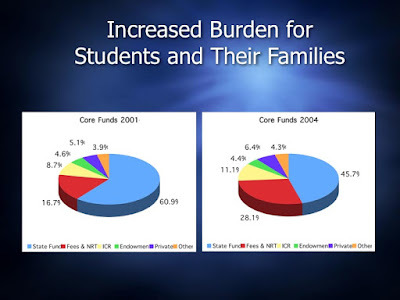 The budget statement that goes to the regents each year is split more or less 50:50 between these two categories. UCOP used to publish budgets with more big categories (it had 4 in 2014-15, for example [page 144]). Multiple administrative activities appear in these baskets, divided up by function (governance, budgeting and finance, etc.) 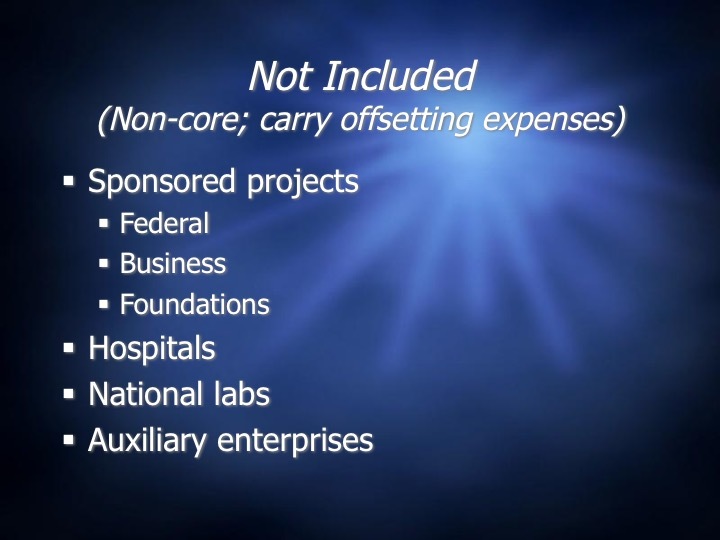 along with systemwide initiatives that can be listed with expenditures for each. The problem seems to start with incomplete lists of programs, and continues with their being funded from two budgets, one of which the auditor calls "undisclosed." The auditor charges (summary here) that UCOP accumulated $175 million in surpluses that it did not disclose, and then spent them through a process that lacks adequate controls. 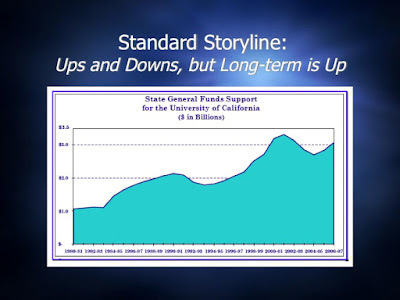 The issue is summarized in the report's Figure 6. I'd add a couple of lines to this myself, but this is better than what the auditor seems to have gotten from UCOP, and UCOP agrees that it will consider adopting this kind of presentation. At the same time, UCOP resents the auditor using the term "undisclosed," argues that these are little more than unspent funds carried forward from one year to the next, that its "reserves" are $38 million not $175 million, that all the money was spent on programs that benefit the campuses, its students, and the state, and that administrative growth merely reflects UCOP's enormously complicated set of jobs that are not duplicated in other university systems. You'd think that this would be the end of it. 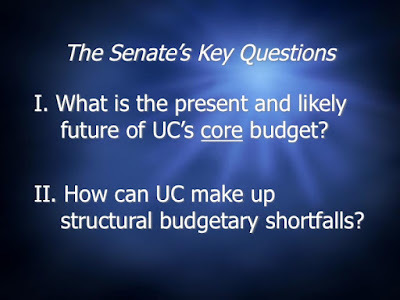 UCOP could say yes, we're moving budget presentations from Figure 6 to Figure 11, thank you for your help, and by the way we regret any confusion, which was entirely innocent, plus you don't understand our inner workings, which is fine because that's our job as a constitutionally independent entity. That isn't what happened. 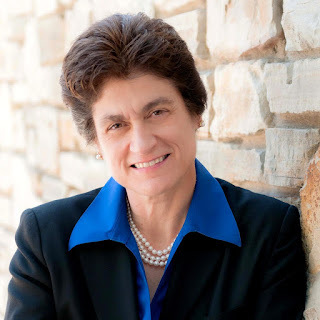 The best of UCOP's response is Janet Napolitano's letter to Elaine Howie. The letter accepts most of the auditor's recommendations, deals with the charges of incompetence by saying UCOP constantly strives for improvement, lists some systemwide programs with budgetary amounts that it says are of value, and rejects the recommendation of tighter legislative control of UCOP. 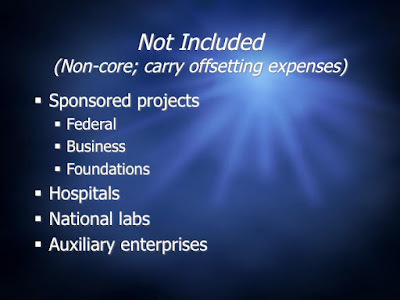 The letter doesn't explain why these expenditures weren't present in the visible budget in the first place or why the initial list of programs wasn't complete. I completely understand the auditor's core beef. 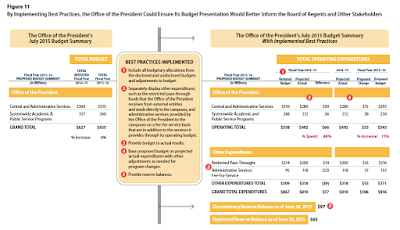 Why can't UCOP automatically produce listings and expenditures for the systemwide programs? Why couldn't they have listed all those that are part of their response to the audit, organize them properly (for example, into the categories, "outside sponsors," "presidential initiatives," and "systemwide faculty research")? 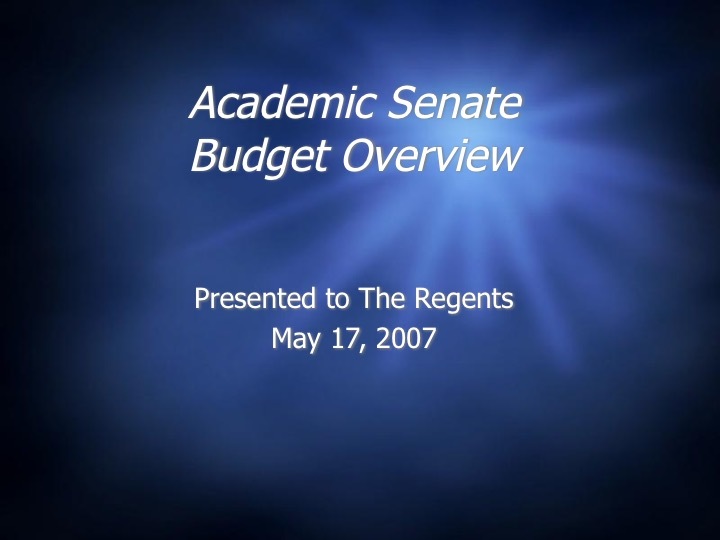 I'm doubly mystified because, over ten years ago, I was personally involved in a two-year Senate inquiry into UCOP's systemwide research programs, where our planning and budget committee (UCPB) made iterative requests for full expenditure data for all programs. It was pulling teeth with pliers, but we made progress over time. Phase 1, a full list of all programs with UCOP outlays, should have been in place a decade ago with regular updates as programs and funding changed, which they certainly did. Phase 2, which apparently never happened, was to be tracking expenditures from UCOP to the campuses. Is the geospatial systems funding--to make up an example-- going directly to fund direct and indirect research costs on several campuses, or have two of the four campuses moved the funding into administrative discretionary funds or, as in one actual case, has a campus converted research money into a pseudo-permanent set of FTE lines in a local department? UCOP should have a handle both on how much is going out and how it is being spent. Apparently they don't. In addition, why didn't UCOP have a unified budget both for the regents and the state? 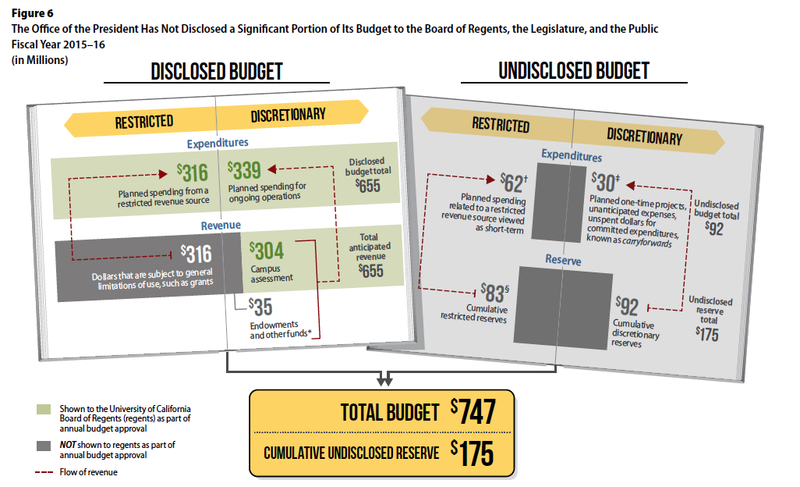 I'm also bewildered by the dual budgets, which is to say that I agree with the auditor that in its multiple lengthy retorts UCOP never really explains the "undisclosed" budget. Why do the books look like that? 169 pages later, I couldn't tell you. In any case, the numbers fly. UCOP generates the gratuitous mud wrestling of Attachment 2, which apparently seeks victory through body count. That attachment is a masterwork of bureaucratic defensiveness. Naturally, it doesn't work. the Office of the President missed an opportunity to receive feedback from its key stakeholders, and it demonstrated an unwillingness to receive constructive feedback. 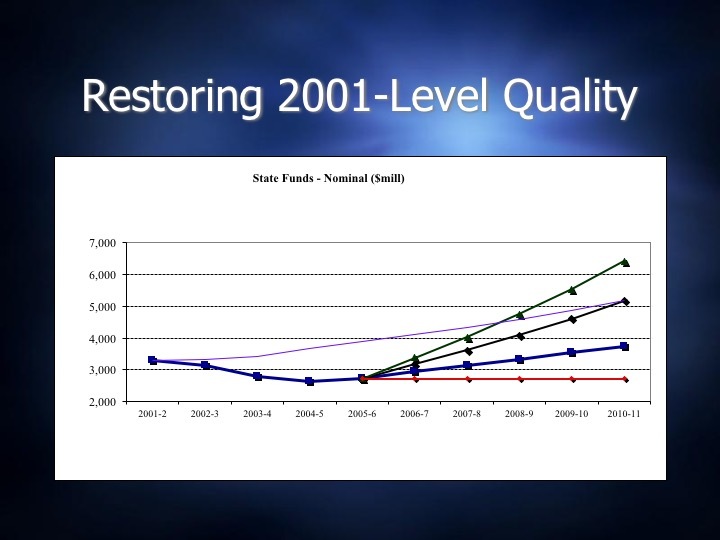 Thus an official state review finds UCOP's accounting substandard and also unlikely to improve. 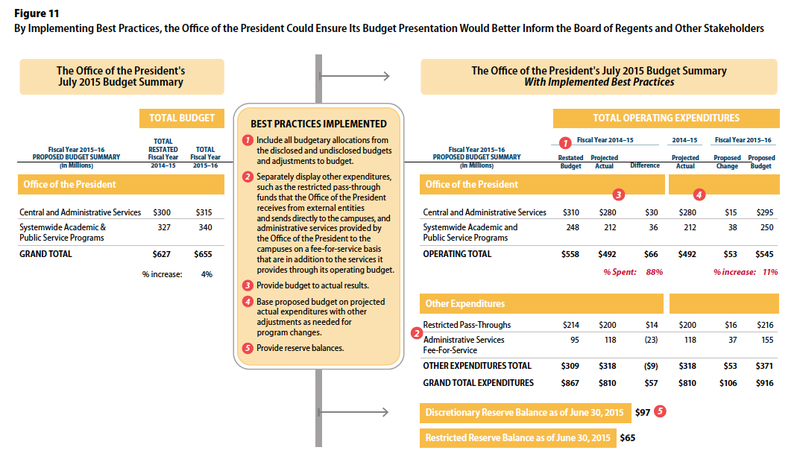 The report concludes that 1 (an undisclosed budgetary surplus) + 2 (unjustified staff growth) = 3 ("significant change is necessary to ensure that the Office of the President's actions along with the mission of the University of California"). 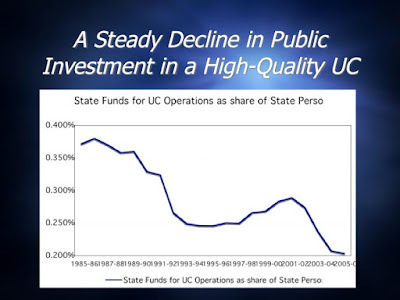 This is a brutal conclusion: the State Auditor is saying that UCOP isn't running UC for the public benefit. 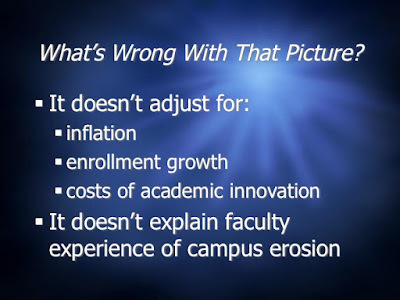 On its face, the statement is ridiculous: the auditor lacks the credentials to question UCOP's judgment about academic priorities, and research, the main component of most of the programs, is part of undergraduate education at a research university, not a subtraction from it. 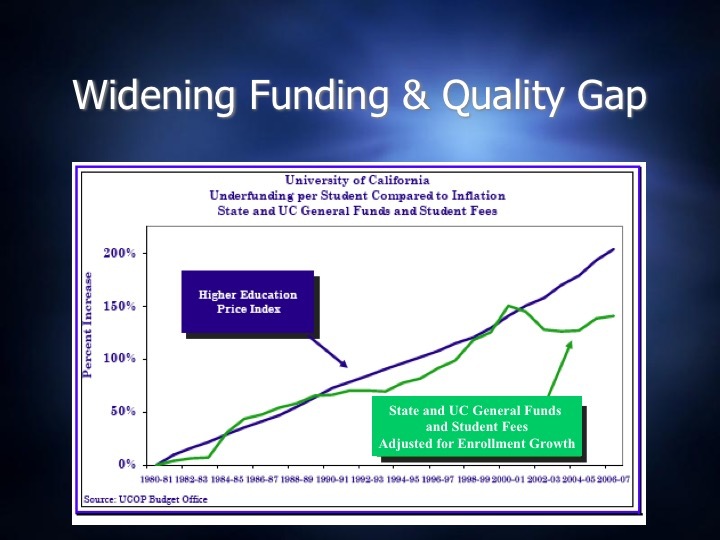 The underlying problem is that UCOP has failed over many decades to explain the centrality of research expenditures to all levels of students. 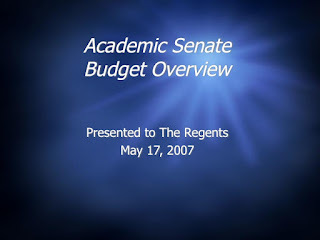 Longtime VP for the budget Larry Hershman believed the legislature refused to grasp the research mission and always would, so the University had to act as though the state's whole allocation was going into student instruction and related services. I don't doubt he had empirical reasons to think this, but most legislators also thought the internal combustion engine had made train travel obsolete. At some point you have to roll up your sleeves and do the tireless teaching that reframes the debate. The tragedy of this particular audit is that UCOP is so busy saying it did nothing wrong that it can't tell the more important story, which is that research is a vital public function that costs enormous amounts of money. UCOP has to subsidize a lot of it or it won't actually happen. It has to use state money to do this, as it always has. 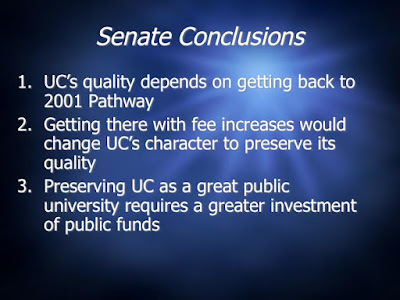 We could argue about how much should be funded by UCOP vs the campuses, which is what we were getting set to do in 2006. We could also argue about whether faculty have been pushed aside in too many of them, and whether the Senate has enough control. But the real issue here is that the state has to pay for research as well as instruction through enrollment-based general funds. UCOP's dual budgets may have been trying to downplay this, I don't know. The strategy stopped working years ago, and now the battle for the state's role in research has to be fought, and not like this. Contrary to the Office of the President’s assertion that we failed to send our survey to those knowledgeable about specific subject areas, we determined that the campus audit coordinator was best positioned to facilitate the response to one survey and the campus chief financial officer, or an equivalent position, was best suited to respond to the other survey. After we sent the survey, the Office of the President’s systemwide deputy audit officer contacted us and followed-up on some technical questions posed by multiple campuses. This level of coordination was appropriate and we took no issue with it. As we know, universities, in exchange for academic freedom, agree to conduct impartial and independent research whose findings can't be skewed by politics or money. And yet the audit claims that senior officials of a leading research university coached the subjects of a survey until they got the answers they wanted. UCOP thus blunders right into a culture war stereotype: academics cheat, just like everybody else. You can't trust them not to waste your tax money. Fake news, fake science, fake climate change, #fakeuniversity. Several changes were made to UC Santa Cruz’s initial survey. Jones told UC Santa Cruz to consider “reframing” or deleting a suggestion for greater systemwide coordination to recruit low-income students, asking administrators there to take into account the central office’s efforts in coordinating disbursement of state funds for underserved schools. “As you will see, I addressed 98% of your concerns and I made a number of additional changes as well (all in a direction you would not find problematic),” UC Santa Cruz Chancellor George Blumenthal wrote to Jones in a Nov. 23 email. Jones provided the email to The Times. 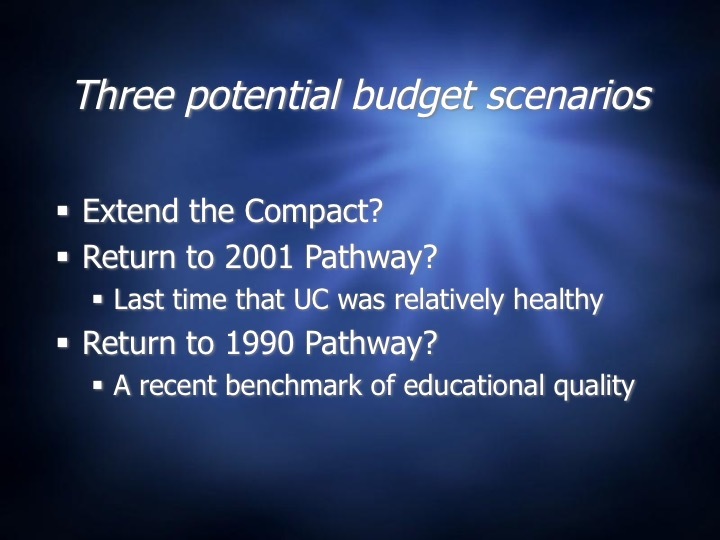 UC Santa Cruz’s initial survey raised issues about the UCPath system, which is aimed at centralizing personnel, payroll and academic processes. UCSC's original statement was already more positive about UCPath than anything that I have heard--it was a very nice comment in fact. UCOP apparently didn't stop with deleting the hint of UCSC criticism, but went on to exact veneration for its public service. Of course in a proper academic survey, if your subject doesn't spontaneously mention your centralized outreach program, that is the datum: it probably means they don't think this program makes much difference to them. In the academic world, this alteration would be research fraud. The auditor was right to toss out the results--except she also published many of them. This part of the disaster seems to me to flow from UCOP's attempt to defend its executive sovereignty over the overall system. UCSC's revised comment-- a smaller campus needs central services-- tries to nail shut the whole can of worms about campuses' frequent duplication of of UCOP expertise. One example was the decentralizing of technology transfer, as over about 15 years one campus after another got their own office of technology licensing and industry alliances, even as UCOP's Office of Technology Transfer continued to preside. (Some of this decentralization is now being reversed.) My simplified history is that UCOP used to curate, develop, and strategically guide campuses. 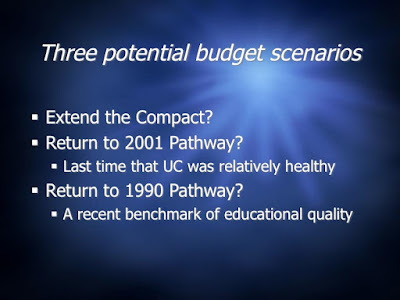 But in the twenty years, and especially in the last ten, perhaps from around the time that regent Richard Blum wrote a memo calling on UCOP to be "strategically dynamic," UCOP has become better known on the campuses for enforcing standardization and compliance. Disconnected from everyday academic life, it offers the public a series of middlebrow tactics. And as these tactics have failed to produce lasting solutions, it has also devoted itself to spin. The budgeting and the survey meddling seem to me to have a common source, which is a closed managerial culture dedicated both to its image and its decision rights. 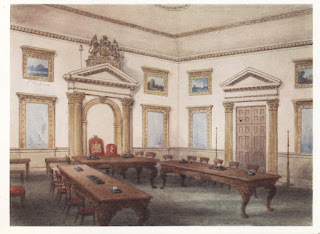 Much if not most of UC has become a culture of silence, of conformity, of handpicked task forces replacing senate committees, of a small list of insiders deciding everything, of non-consultation, of divisional senates that provide no information much less active discussion with their supposed constituents, of shunning or quiet retaliation in response to dissent. Senior managers are not meaningfully accountable to their subordinates, including to the tenure-track faculty. Some performance reviews are on a cycle and some are discretionary, but in either case comments are generally by invitation only, and results are never publicized. If actions are ever taken, they are taken from above, and truthful explanations are not given. 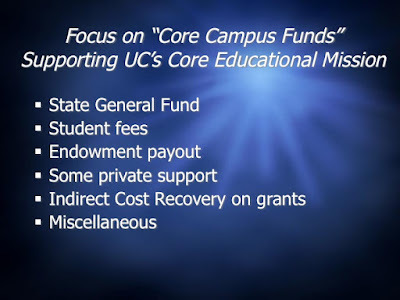 UC's response to in this case is a good example of this closed culture at work: the chair of the Board of Regents posted a video pep talk that closes ranks with UCOP. She didn't even mention the audit's criticisms, much less promise to deal with them. It's hard to imagine any regent confronting the cognitive and ethical failures that closed cultures create. 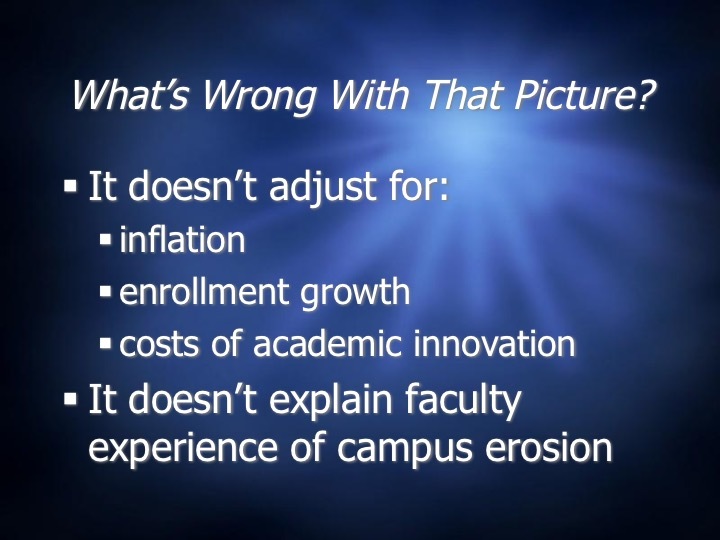 Like the proverbial frog that doesn't notice the water is getting hotter, we UC faculty don't seem to have noticed our gradually increasing cynicism about our university and state. Increasing cynicism has led to lower expectations. In my email over the past few days, a number of faculty have said "well what do you expect," or "that's politics," or "that's UCOP," or "UCOP's bad, but not as bad as the legislature." Obviously I oppose legislative control, but we can't afford to wallow year after year in this choice between the legislature's intrusive austerity and UCOP's executive autocracy. UC will go nowhere if it can't make a plausible case for its public good stature. The prerequisite to both these things is an open culture. Open administrative cultures depend on active governing involvement of students, faculty, and staff.